Macroeconomics, Microeconomics, Cusack’s Universe, Wave equation. 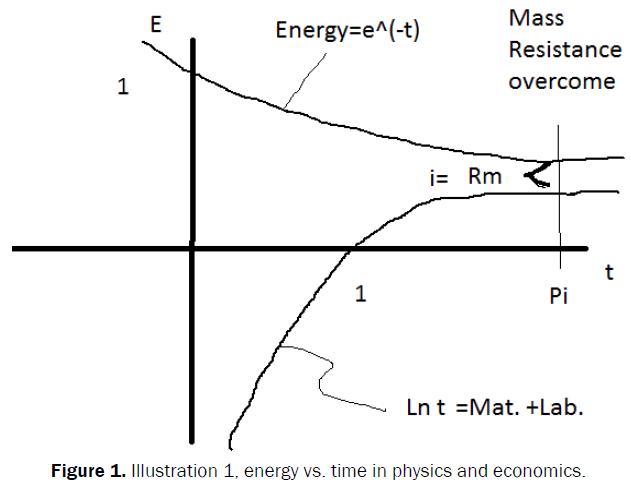 Figure 1: Illustration 1, energy vs. time in physics and economics. Rm = Resistance to Mass formation; or the cost of money i. Mass Gap = 1/G where G = 2/3 = Gravitational Constant. Since it takes money to make money, the more money one accumulates, the more one has to invest and make more money. It is the same with Mass or matter. Gravity works the same for money as it does for matter. The Wave Equation governs atoms and individuals in an economy..
Now,(1+ e^t) = 1.73 = eigen vector. The Economy is always seeking to find this Optimum condition. When Individuals seek to save 15% or 1/7 or their Income which is used for Investment, the Economy is functioning “on all cylinders”. It creates an economic situation where the velocity of money is equal to the supply. There are no funding sources and no conflicts of interest. Bohm D. Quantum Theory. Dover Publications. 1989;1-30. Paul CusackTE. Astro-theology: Cusack’s model of the Universe. Lulu Publications. 2015;1-629.